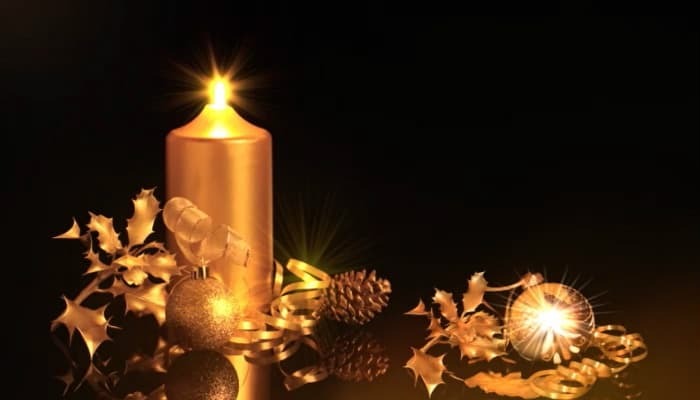 Candles are a well recognised symbol during the Christmas holiday period and our eloquent Holiday candles design conveys sophistication and class which makes it perfect for Christmas ecards for business. If you are a business owner who usually sends paper cards to your employees to thank them for their hard work, or maybe you post cards to your customers, then why not send our Golden Candles ecard instead? There has been a considerable shift in recent years from the traditional Christmas card to ecards. Most notably because of the vast improvement in the quality of ecards and of course the increase in people having email addresses and carrying out many things such as shopping and communicating via mobile devices and tablets. Applying the very best design techniques, we can create truly magical festive designs. Our Golden Candle design is surrounded by festive foliage such as pine cones and holly leaves to add to the elegance of this gold design. Ideal for corporate use, this ecard can be used as a way to communicate with customers over the festive holiday season, sending them good wishes for Christmas and the New Year. You can rest assured that the corporate holiday ecards from us are of the highest quality and we take great care in our template designs.